Today’s post is about one of the very common dish which I make when some special guests come to my house. Wondering who could be the special guests – Its none other than my daughter’s friends who come home for a play date. Feedback from these little guests is always good and they are genuine too. 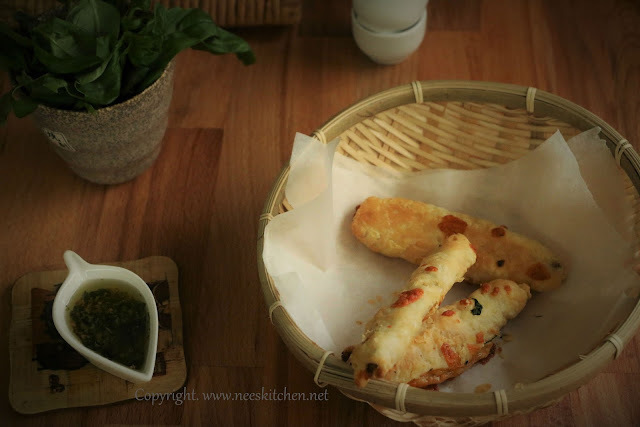 Cheese & Bread stuffed puffs is puff pastry brushed with basil oil and stuffed with Red cheddar & Mozeralla , bread slices and baked in oven for a crunchy snack. I choose whole grain bread for this recipe, however any kind of bread is fine for this. I used a puff block which requires some defrosting time you may use any sort of puff pastry for this. You may make the stuffing a day before and put them in refrigerator also. 1. Defrost the puff block. 3. Take the puff block. Add wheat flour to roll the pastry. 4. Roll the pastry like how we do it for chapatti flipping them often. Sprinkle the flour whenever you find it difficult. The flour will be absorbed easily as puff pastry has lot of oil inside it. 6. Brush them with the basil salad oil. 7. Cut into thin slices of 10 cm length and 4 cm width. 12. Place the oven tray and bake for 20 minutes turning in between so that all sides are cooked evenly. Cheese & Bread Stuffed Puffs is ready. Serve hot.